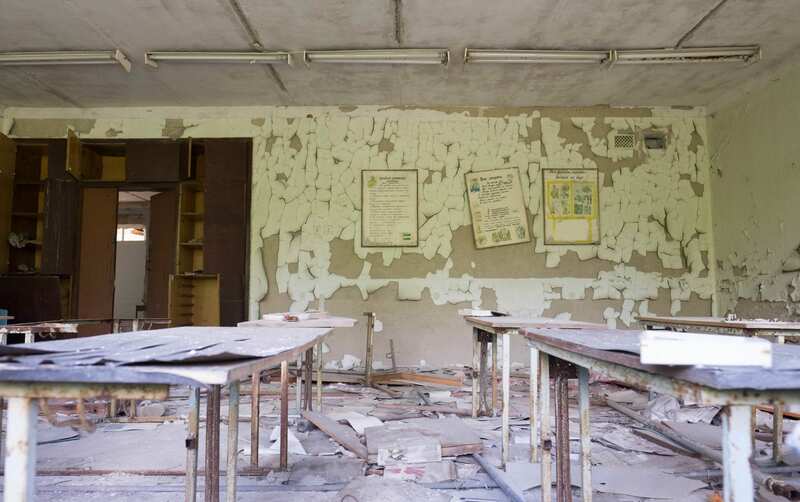 When I began planning my trip to Ukraine, I knew I wanted to find a way to visit Chernobyl, home of the nuclear disaster site of 1986. Chernobyl? You can go there? Yes, you can. Tours have operated for years now. Yes, this tour is. 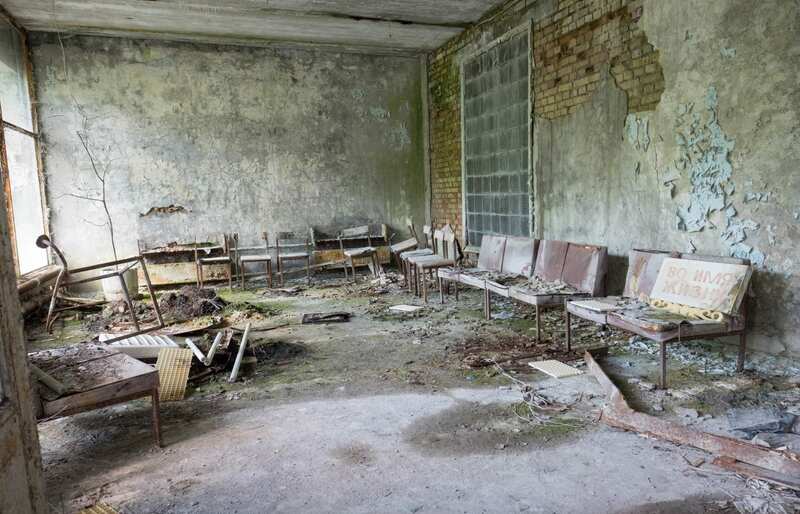 Today, more than 30 years after the Chernobyl disaster, the amount of radiation you experience is very little. Like eating two extra bananas. Radiation is in everything. 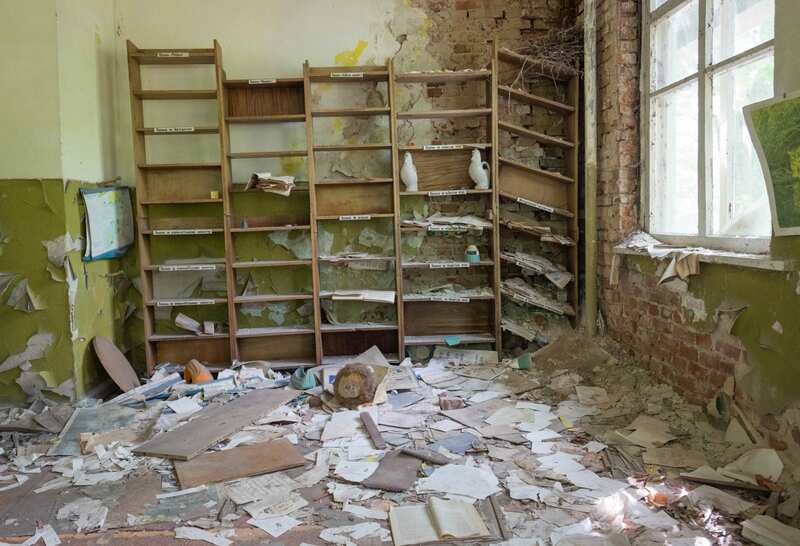 Some zones around Chernobyl are more affected than others, but you don’t spend much time there. 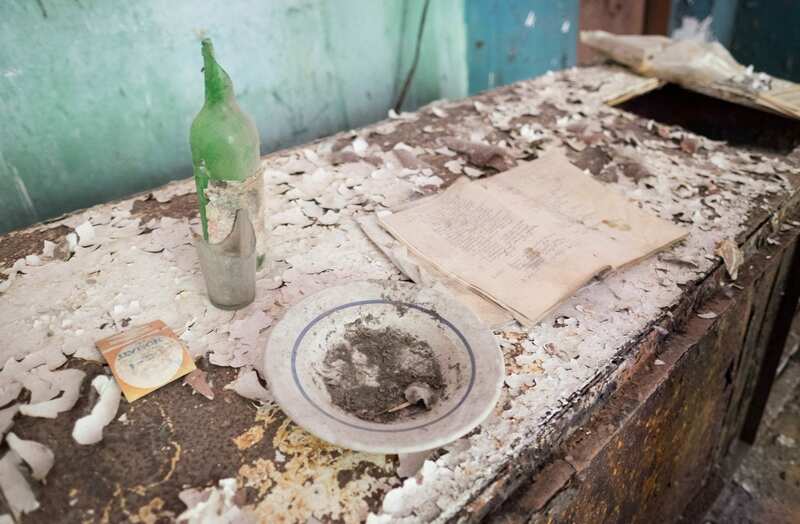 To experience a time capsule — a genuine ghost town. 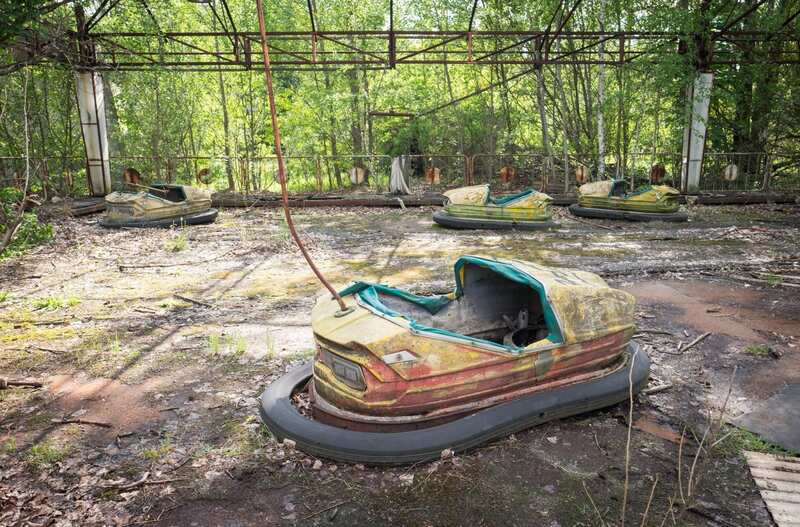 The people of Chernobyl and the nearby town of Pripyat left thinking they would be gone only a few days. They never returned. 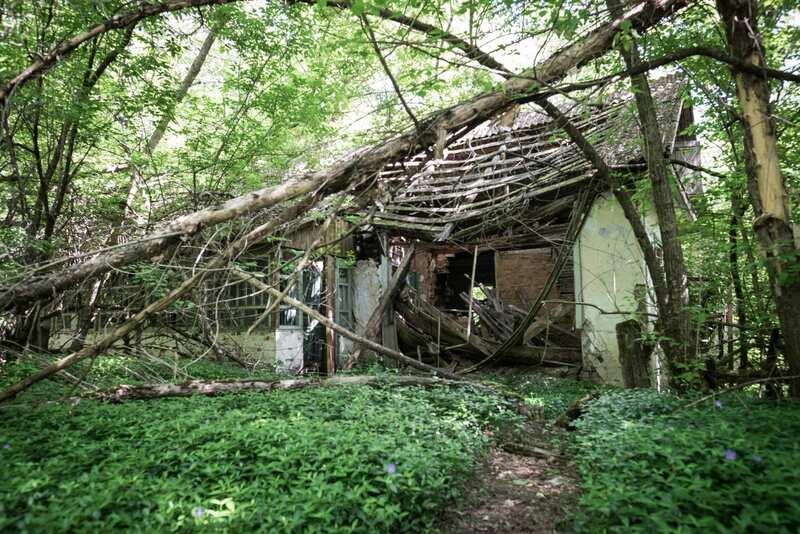 The town is now frozen in time and increasingly reclaimed by the forest. On the early morning of April 26, 1986, workers were running tests to see if the turbines could produce enough power to keep things running in the event of an outage; to test this, the safety regulators were turned off. During the test, the power fell too low (1% rather than the target of 25%), and the power needed to be slowly increased. Instead, there was an unexpected power surge and the reactor’s emergency shutdown was not activated, resulting in an explosion. 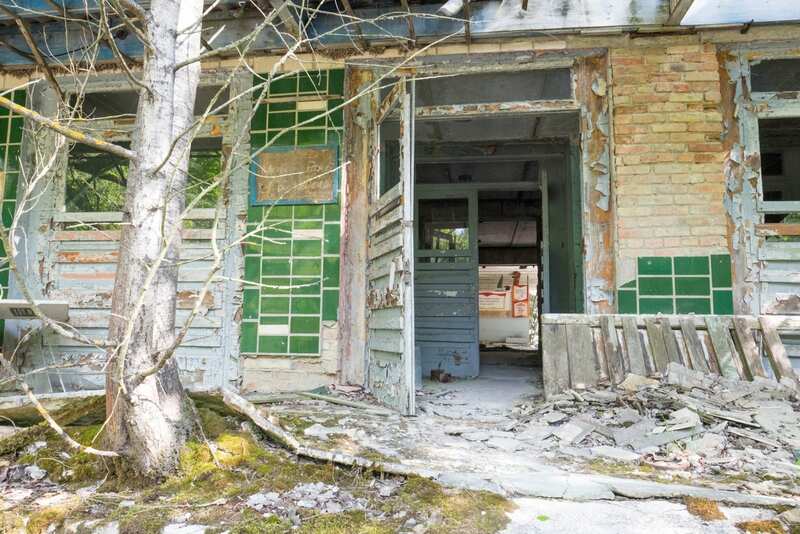 More radiation was released at Chernobyl than at Hiroshima in 1945. 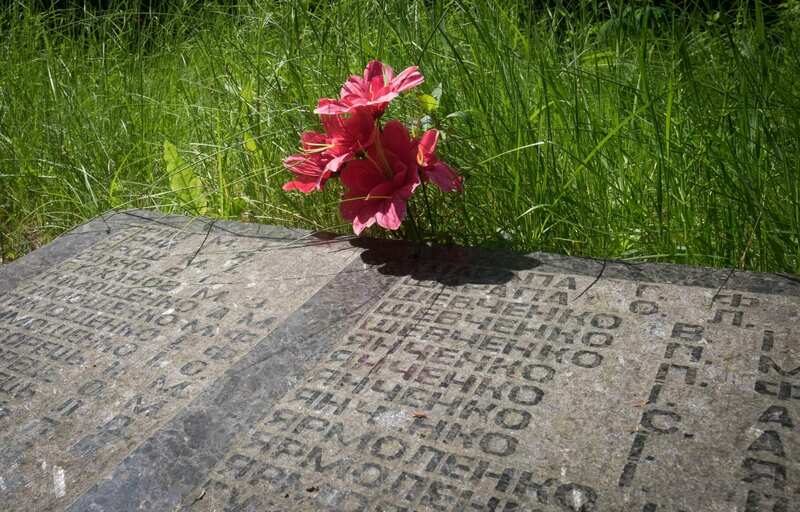 To this day, Chernobyl is the only nuclear accident that resulted in deaths solely from radiation. 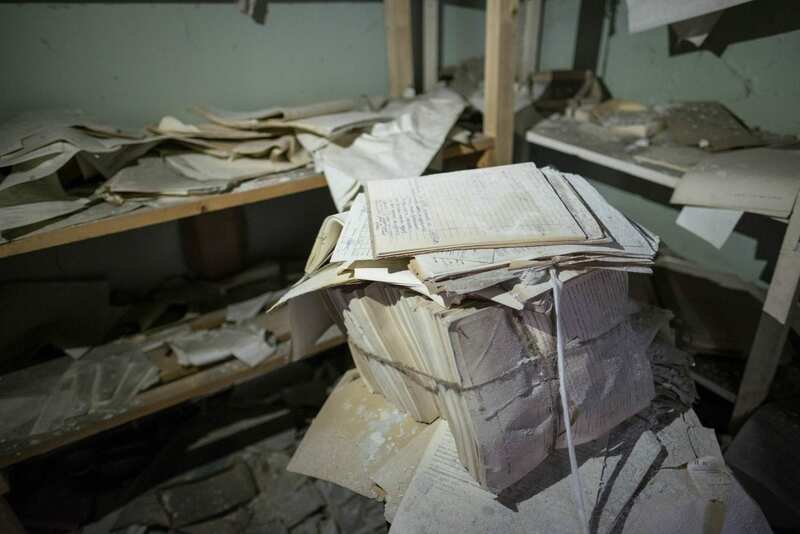 The Soviet Union kept it quiet, hiding the disaster from the world. It wasn’t until workers at a nuclear power plant in Sweden realized that literally everyone was setting off the radiation detector that something was wrong. (That’s an interesting story.) Sweden alerted the international community; Moscow initially denied anything happened, then admitted the accident. And we still don’t know for sure how many people died as a result. Nuclear groups say 10,000; environmental groups say it’s closer to six figures. Two people died immediately and 29 more died in the following days, but the death toll since from cancer and other radiation-induced diseases has been much more difficult to quantify. Roughly 4,000 children in the region were diagnosed with thyroid cancer, but more than 99% of them recovered. 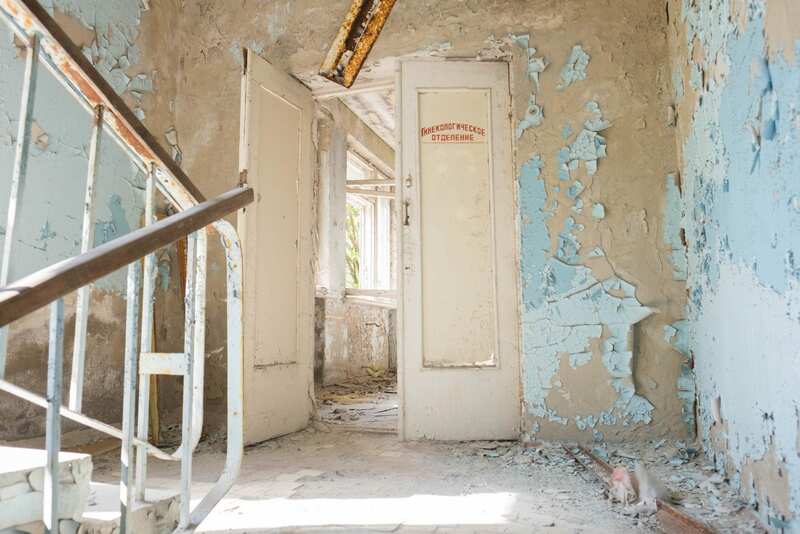 For more on Chernobyl, see reports from the Nuclear Energy Institute, the World Health Organization, and Greenpeace. For the academic study, see the UN’s report from 2011. There are a few different tour companies based in Kiev. 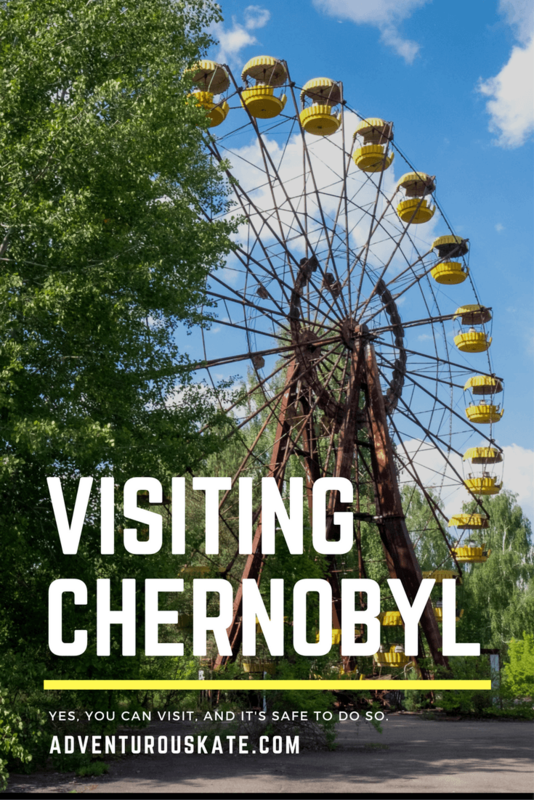 I was hosted on this trip by JayWay Travel and they arranged for me to join a one-day Chernobyl tour with SoloEast Travel. 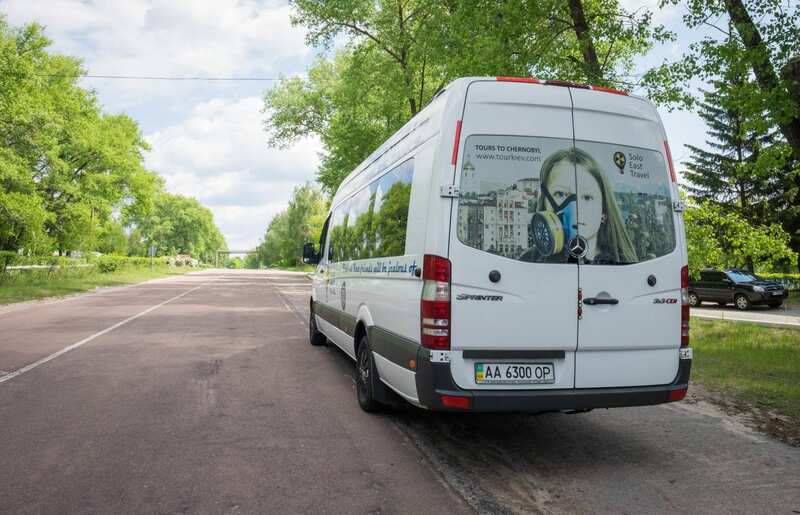 Our small group tour met in Kiev and we went on to a minibus for the two-hour journey to Chernobyl, watching a documentary about the disaster en route. Some people chose to rent radiation meters that monitored the levels around us, beeping shrilly if the level got dangerously high. As we got closer, we began to pass through checkpoints where our passports were checked. We were now officially in the affected nuclear zone. Aside from the road into the zone, we were surrounded by wilderness; it’s only when we got closer that we were able to see the remnants of buildings. Here are some of the places we saw that day. A car half-reclaimed by the landscape. This is a town hall of Zalesye, one of the small towns surrounding Chernobyl. 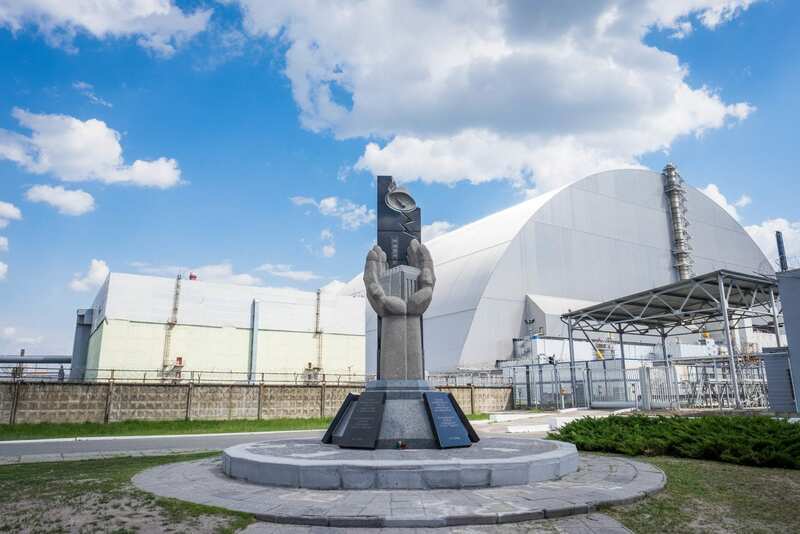 This is not a Chernobyl disaster memorial — it predates it by a long time. This is the firefighters’ memorial. They were the first line of defense in the disaster and poured cold water into the reactor before their efforts were abandoned. Many of the 29 who died in the first days of the disaster were firefighters. We visited the electrical grid. Someone pointed out that it would make a hell of a venue for a concert if it had been anywhere else. 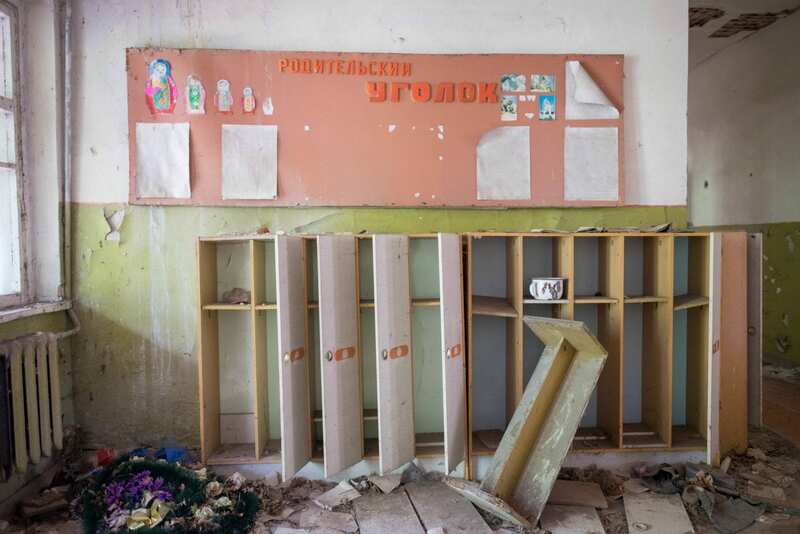 One of the best-preserved sites around Chernobyl is the kindergarten. Here you’ll find children’s playthings scattered around beds. It felt like the inspiration for a horror movie. This was also where we could detect a higher presence of radiation on our meters. Nadia had us experiment with them, bringing them down close to the ground (which we were not supposed to touch with our hands) and they began beeping even louder. Walking into a room and having that doll staring right at you — that’s not creepy at all. Rows and rows of children’s beds. A library? Or perhaps cubbies for the children’s things? Look at those tiny blue shoes. 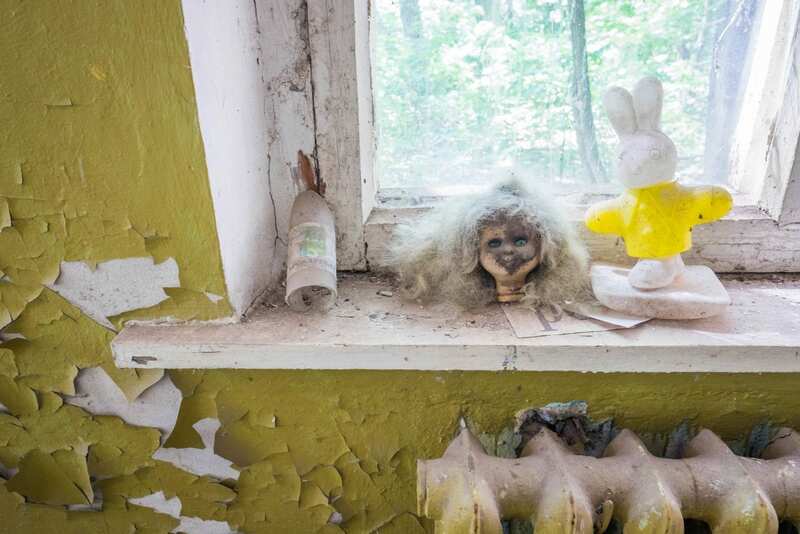 A doll head and bunny on a windowsill. 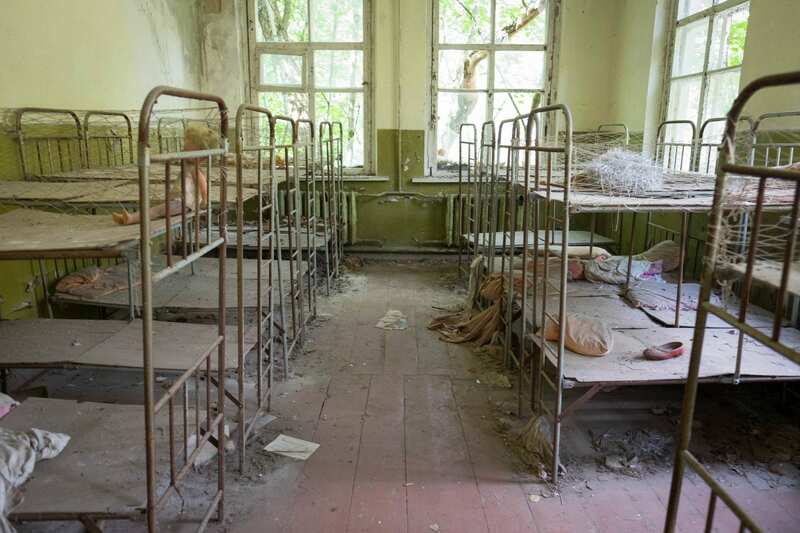 Imagine all the children who slept there over the years, never to return, vanished in the blink of an eye. 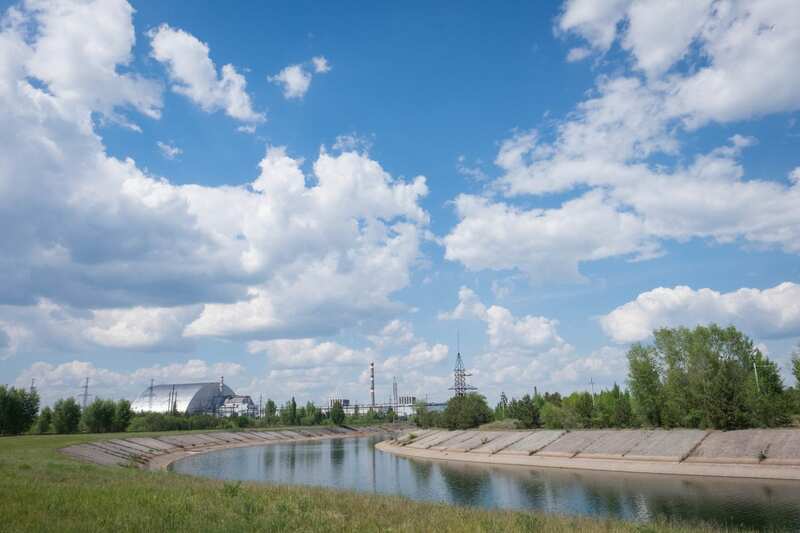 I was shocked to learn that Chernobyl is still home to several functioning nuclear reactors. I assumed that the site was totally shut down; this wasn’t the case at all. 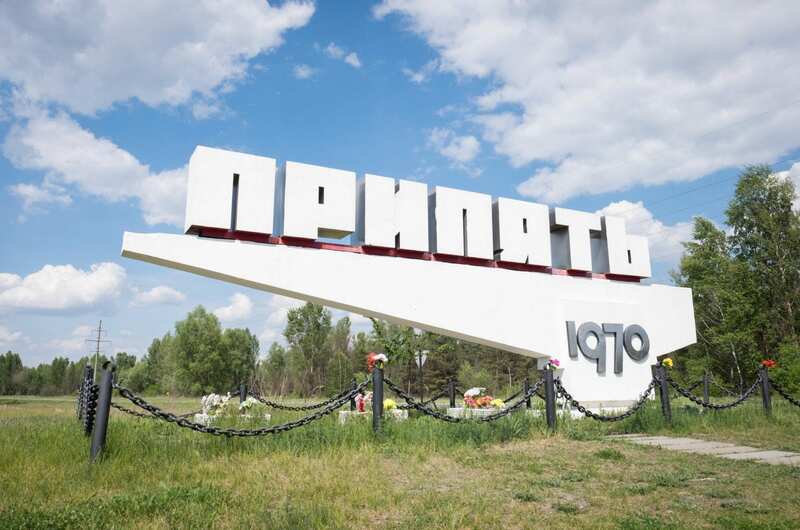 Reactor Four was shut down, as that’s where the disaster took place, but the others were vital to Ukraine’s electricity needs and they’ve been running continuously ever since. A sarcophagus was built on top of Reactor Four to contain the radiation. We were able to view from 270 meters away. 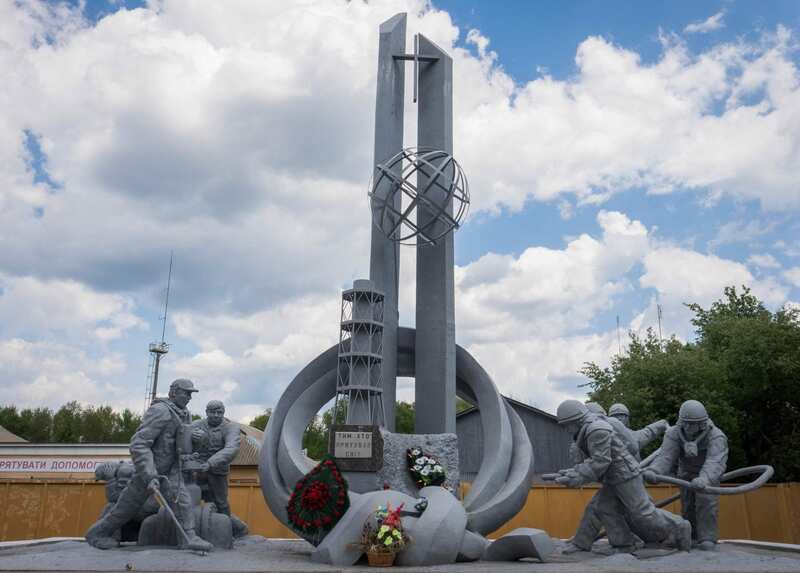 There is another memorial behind Reactor Two. 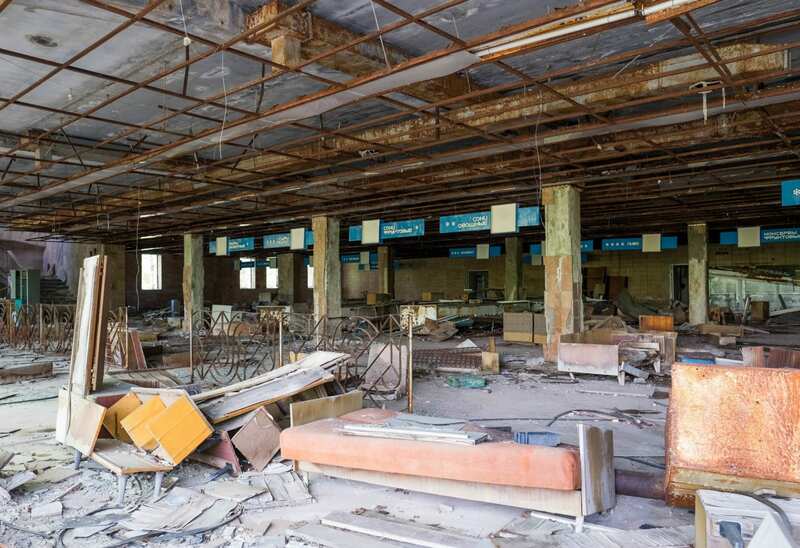 Pripyat was founded in 1979 with the purpose of serving the Chernobyl power plant. By 1986 it had a population of approximately 49,000. 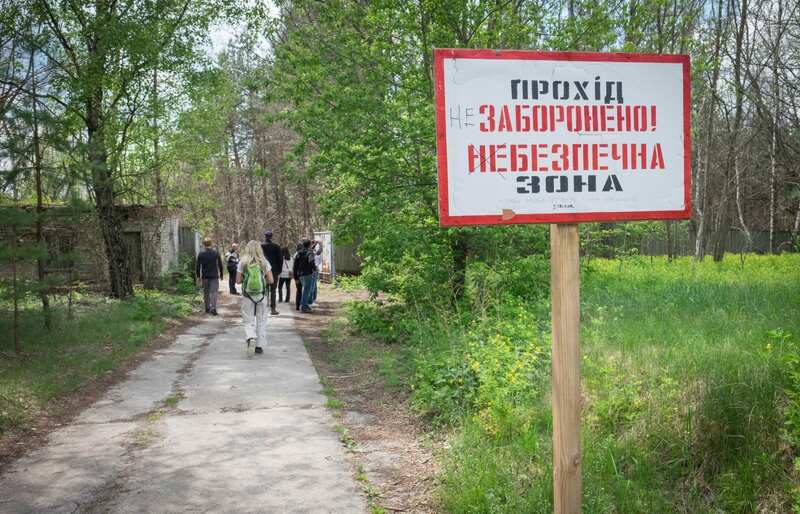 The nearby town of Pripyat was evacuated until April 27. Locals were told to leave and that they would probably be back in a few days. 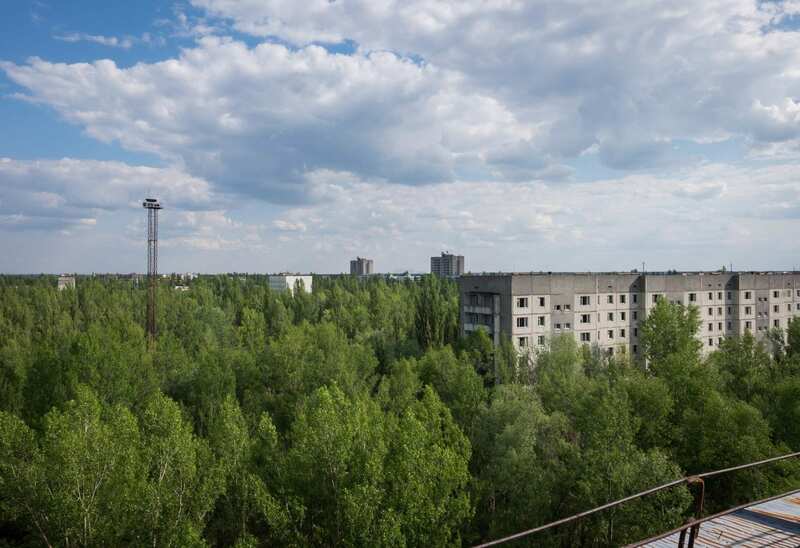 According to locals, most of the younger people were happy-go-lucky about it and didn’t care; it was Pripyat’s oldest residents who sensed that this could be a much more serious disaster than they were being told. It was deeply moving to walk around this town and see where people lived their lives. 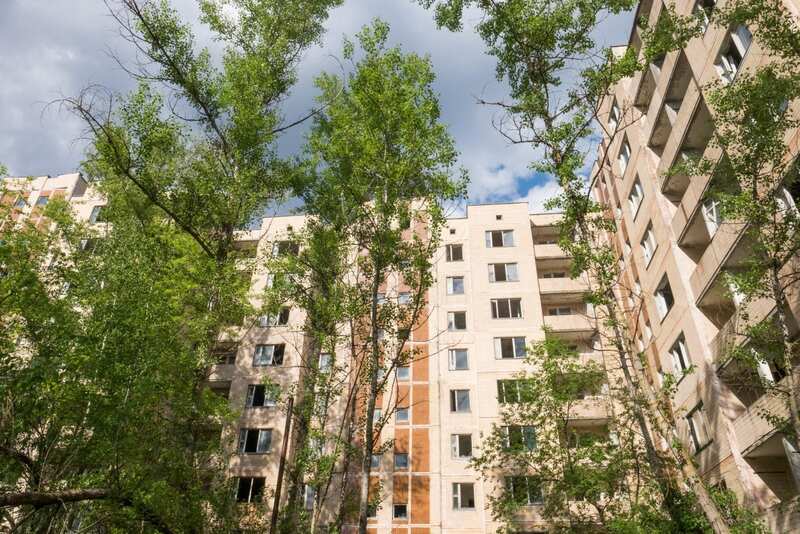 So often it would seem like we were walking into the deep forest, only to suddenly be in front of a large apartment building, or hospital, or hotel. This was perched on the lake — imagine coming here to enjoy a beautiful afternoon. 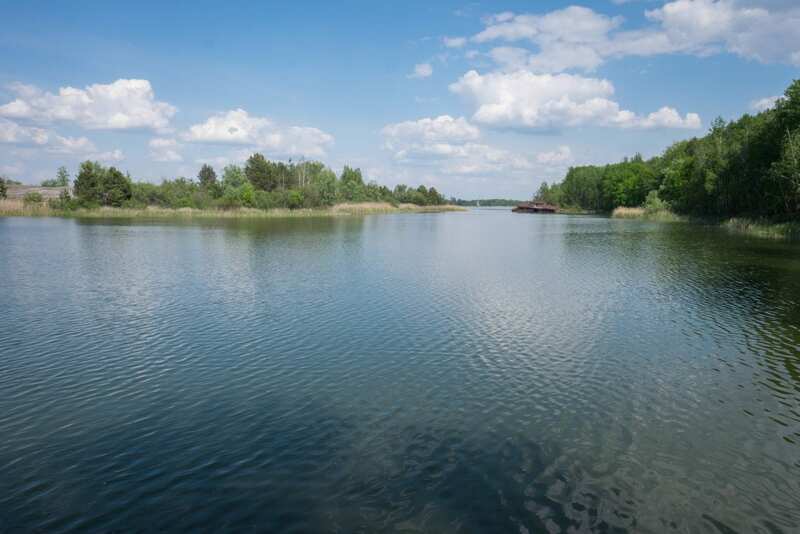 And the lake itself…it’s as if nothing happened. And the local supermarket, the signs above the aisles still in place. The local stadium. 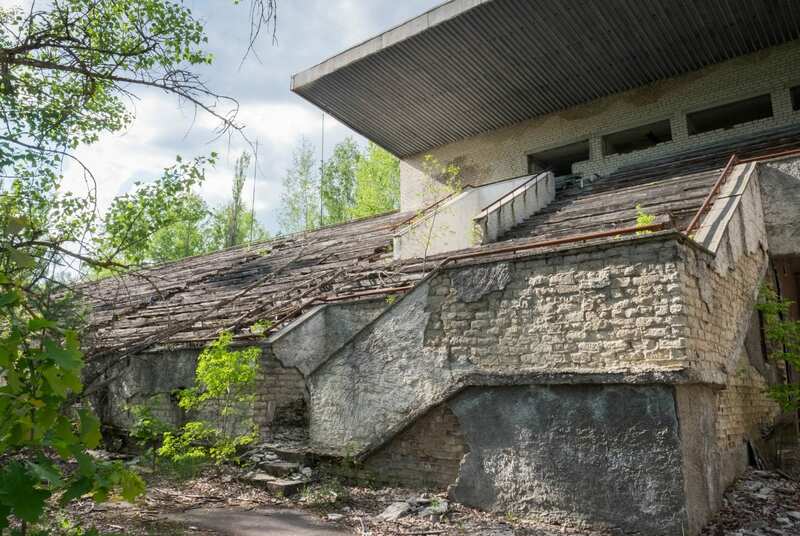 Later we watched film clips from Pripyat and it was particularly creepy seeing this stadium full of people, cheering on a collection of athletes. Lest you forget that you’re time traveling to the Soviet Union, here are some propaganda posters. 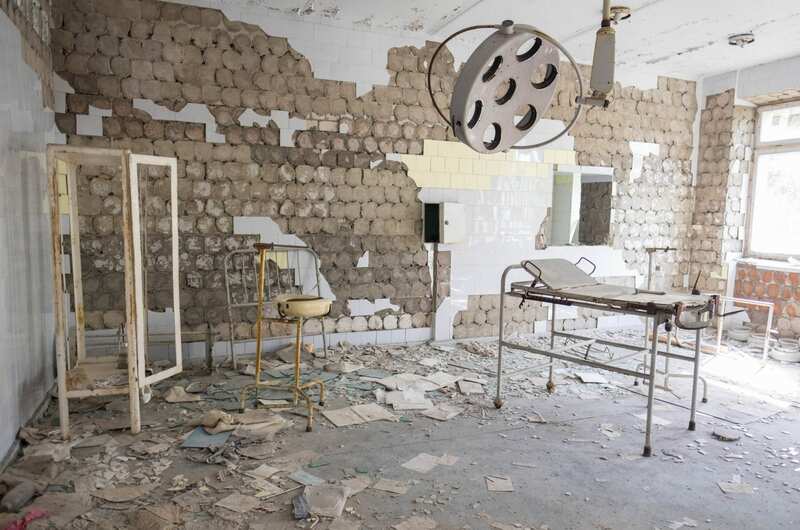 The most memorable place we visited on the trip, for me, was Pripyat’s hospital. Here’s what it looks like today. This was the waiting room, the chairs still in place. This could almost be an outtake from an HGTV show. A decrepit staircase led us up to a new floor. Reports upon reports in the pre-digital era. 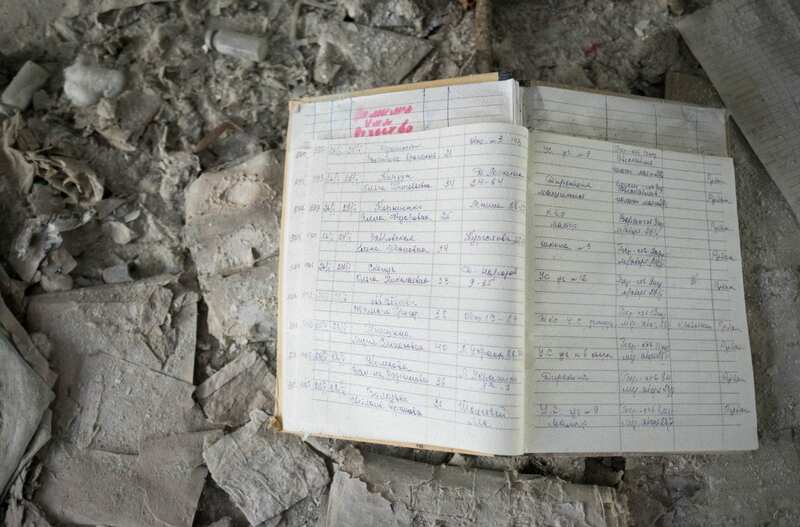 An appointment book, likely recently opened among the rubble. 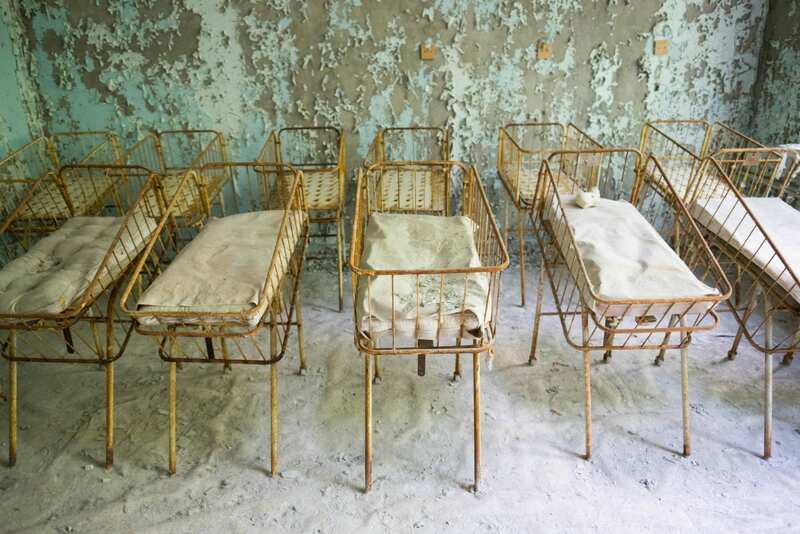 And probably the single most memorable image I have of Chernobyl: lines of empty bassinets. Our guide Nadia told us that while some visitors think that people have moved items from Chernobyl around (and the creepy dolls in the kindergarten definitely move around), but these bassinets have never moved as long as she’s been a guide. 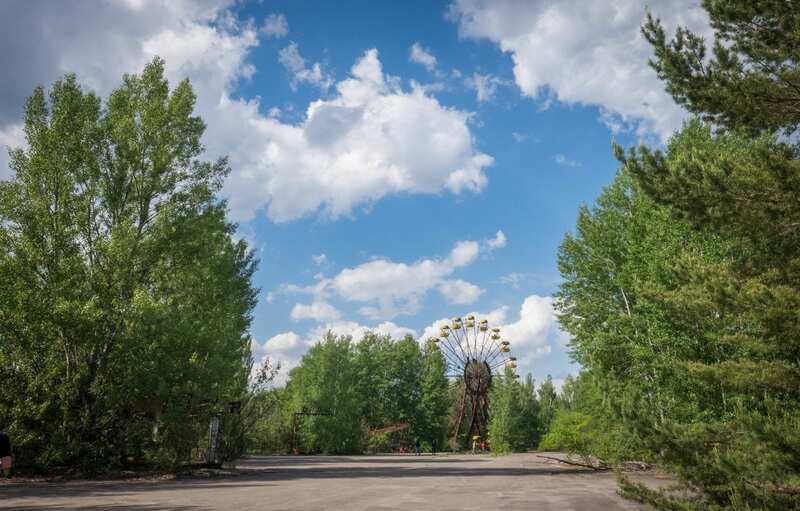 On May 1, 1986, a carnival was set to open in Pripyat. The rides were already there at the time of the disaster. 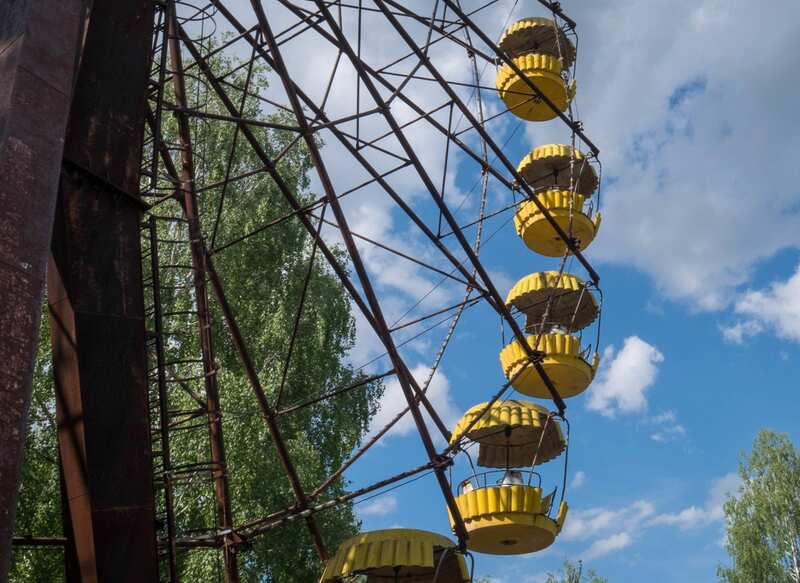 The Ferris wheel is the most photographed and perhaps most famous place in all of Chernobyl, post-disaster. The Ferris wheel up close. There were bumper cars, too. So happy and yellow against the blue sky. Such joy displayed in a joyless place. For our final visit, we visited an apartment building that wouldn’t look out of place in Berlin or Helsinki today. We climbed eight flights of stairs until we hit the roof. From the top of the roof, we saw buildings poking gently through the trees, reminders that there used to be a whole town here. 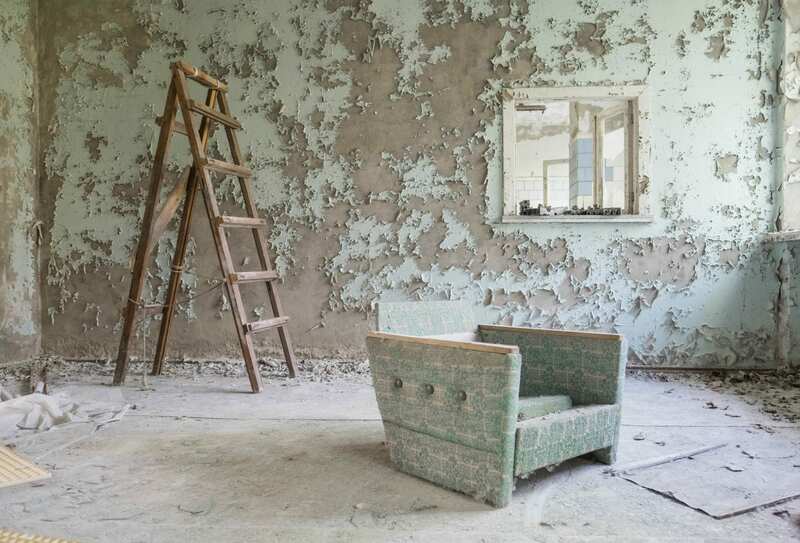 This was a place where people lived, and loved, and worked. 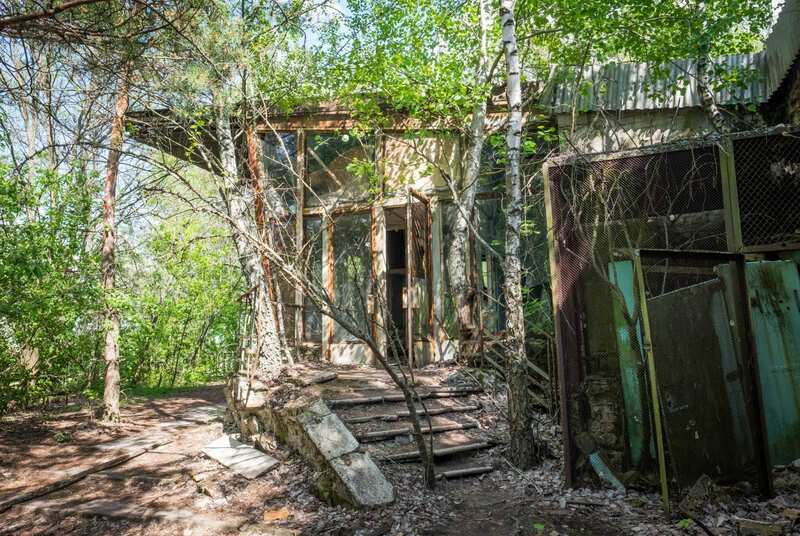 And as soon as people left it, it was reclaimed by the forest. 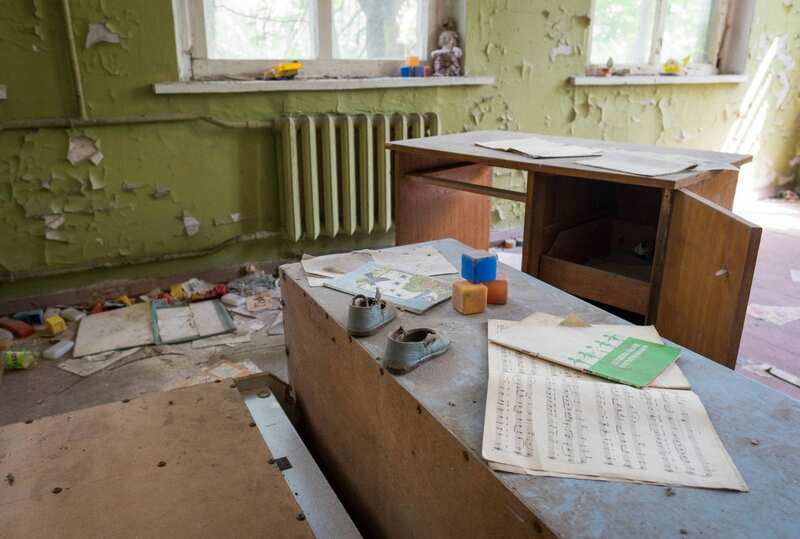 It’s easy to look at somewhere like Chernobyl and think, “It could never happen here” — but it could. In fact, it already is happening. Take a look at southern Louisiana. If you’ve read the book Strangers in Their Own Land, you’re familiar with the sad state of parts of southern Louisiana. Louisianans continue voting for candidates who promise environmental deregulation. Louisianans vote for these candidates thinking that this will lead to more petrochemical jobs in the region (though a great many of them will vote for the anti-choice candidate no matter what). As a result, their lands and lakes and rivers are poisoned, it’s no longer possible to fish on the lands their families have fished for generations, and cancer rates are skyrocketing throughout the region. As climate change heats up, we need environmental regulation to protect ourselves and our children so that this can never happen again. 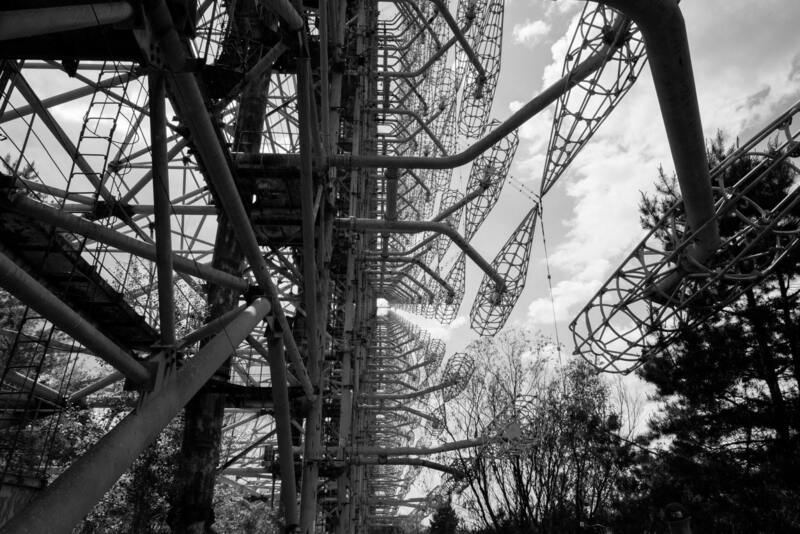 After all, what I saw in Chernobyl proves that the planet will be just fine, no matter what happens. It’s just whether humans will be able to survive on it. 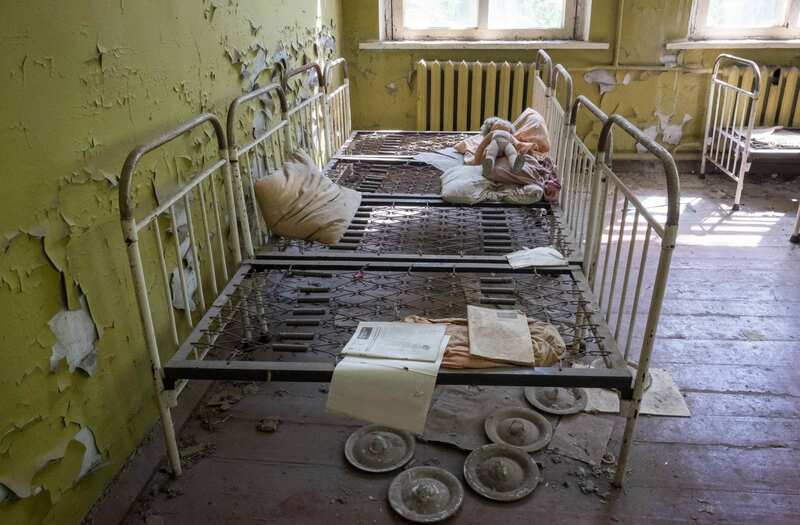 If you visit Chernobyl, please remember that a lot of people died as a result of this disaster. Treat this place with sensitivity. If you visit with compassion and an open mind, this will be a very fulfilling trip for you. I think that Chernobyl is one of the most deeply moving places I’ve ever visited. I spent most of the trip quiet, thinking about everything before me and its implications in the world today. Well. 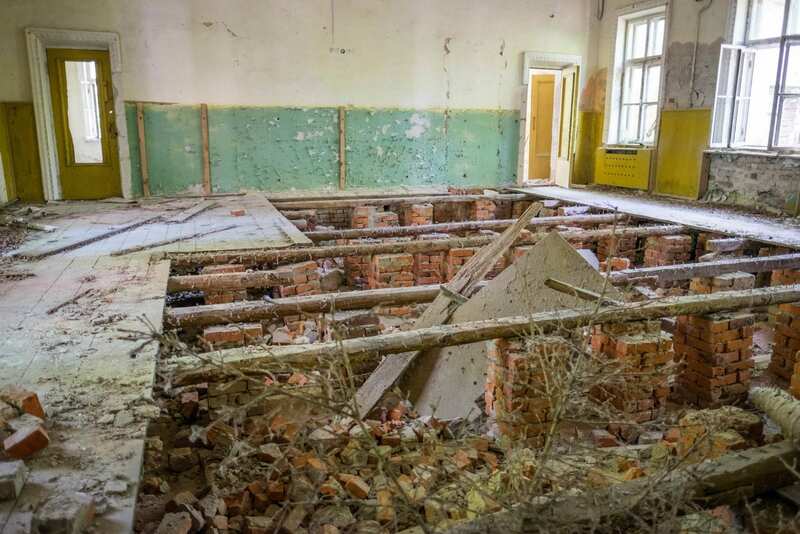 I grew up in Massachusetts, and when I was growing up, our church provided housing to several people from Chernobyl who were going to Mass General for medical treatment. They were dealing with cancer and birth defects as a result of the disaster. So it’s not over for them — not remotely over. I brought this up with Nadia and she listened. And it got me thinking. 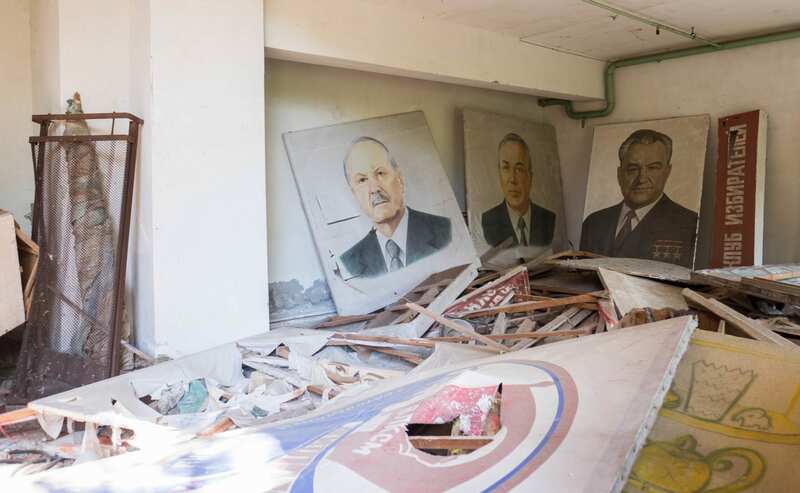 Is it a Ukrainian/Soviet attitude to say that it’s over now? Is it because our guide was young and hadn’t even been alive during the existence of the Soviet Union? Is this the attitude we see in Russian literature and art, and even Russian music? Does what she said about the disaster represent the mindset of the region as a whole? I don’t know, but it’s something to think about. 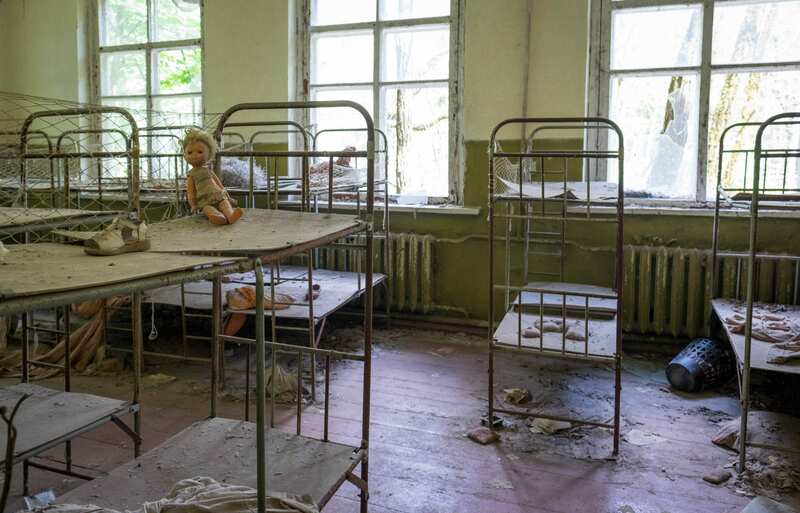 All I know is that I am deeply grateful to have been able to visit Chernobyl, and I will never forget my day there. 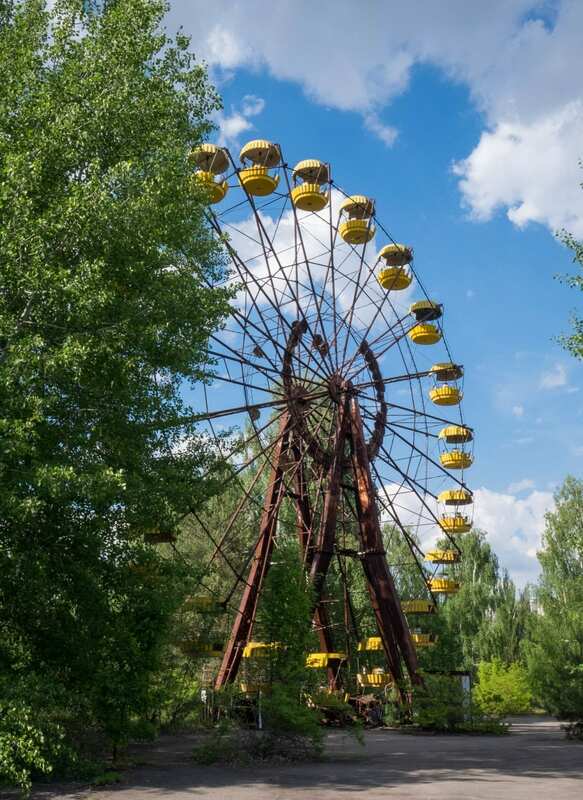 I visited Chernobyl through a tour with SoloEast Travel. I was very happy with our tour and would recommend it. Tours start and end in central Kiev and include lunch. One-day tours cost $79. You will need your passport for this trip — it will be checked at several points. Wear close-toed shoes, long pants, and a long-sleeved shirt or jacket. 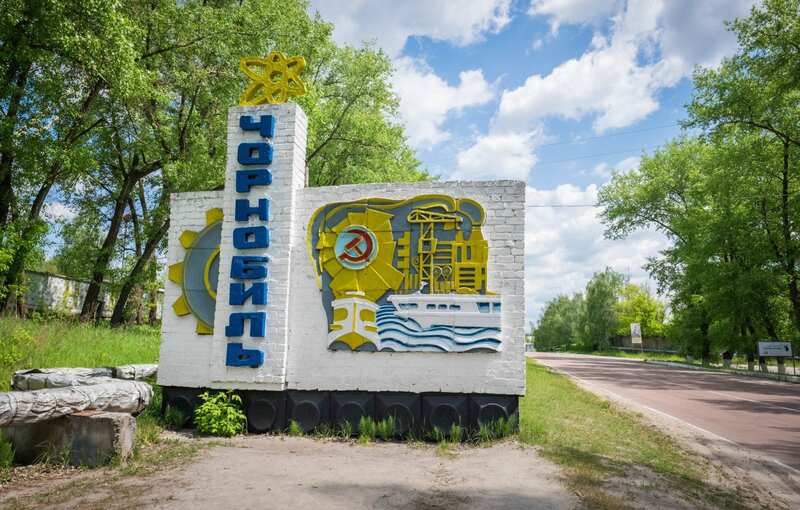 SoloEast also offers two-day Chernobyl tours, where you stay overnight, for $299. While in Kiev I stayed at the Theatre Apart Hotel, which I enjoyed and would recommend. Rooms from $39 USD per night. Find more hotels in Kiev here. Don’t visit Ukraine without travel insurance. Whether you get appendicitis and need to be hospitalized, or your phone gets stolen, or an injury means you need to cancel all or part of your trip, travel insurance will help you out. I use and recommend World Nomads as travel insurance for trips to Ukraine. 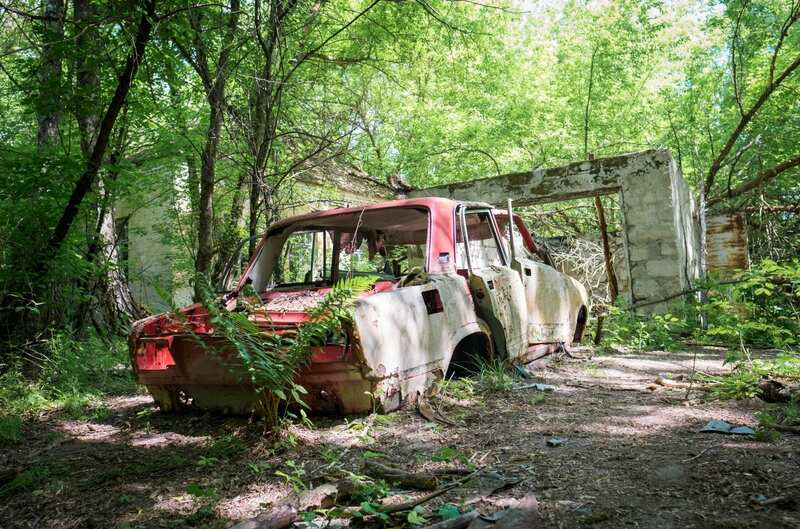 Would you ever visit Chernobyl?